On October 25, Prime Minister of MoldovaPavel Filip informed about opening the office of the North Atlantic Alliance in Kishinev. So long-awaited event will take place on December 1 this year. This will allow NATO officers to legally stay in Moldova on an ongoing basis. It is symbolic that the head of the Moldovan government announced the forthcoming occupation of the country by the NATO bloc on the next day after the illegal appointment of the 32-year-old EvgenySturza, the deputy chairman of the People's European Party of Moldova and the former adviser of Prime Minister Vlad Filat convicted on corruption charges. In order to appoint Sturzatothe position of the head of the military department, opponents of Moldovan sovereignty took an unprecedented step: they suspended temporarily the president of the country, popularly elected Igor Dodon. The speaker of the puppet parliament, Andrian Candu, fulfilled his duties on appointing the head of the military department. 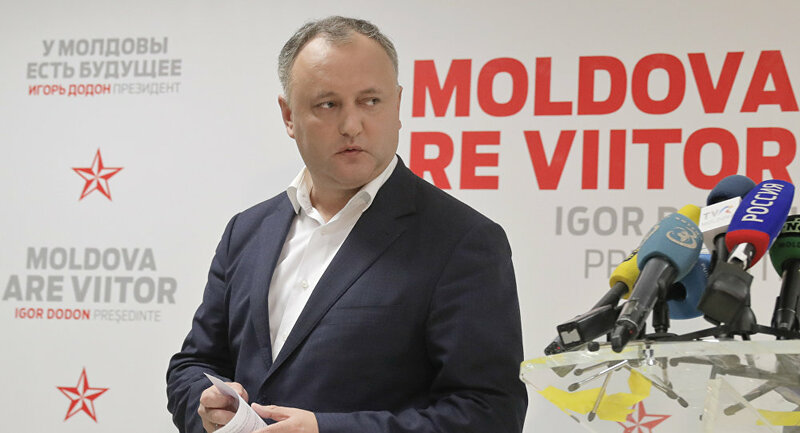 Dodon described what happened as a usurpation of power, which is "the highest crime, according to the Constitution of the Republic of Moldova". However, the Constitutional Court, five of whose six members are Romanian citizens, has taken the side of the government and parliament. The same body had previously banned Dodon from holding a consultative referendum on the four key issues of the country's political development, and one of them was the question of increasing the president’s powers. According to the popularly elected head of Moldova, the government and the parliament went beyond political legitimacy by using the Constitutional Court for swearing the Ministry of Defense. Dodon is convinced that the Unionists made a serious mistake, which will return to them as a boomerang. "Now all citizens could be convinced of the need to move to the presidential state, where the directly elected head of the country has additional powers that are indicated in the Constitution, and as political logic requires them," the Moldovan leader said. "Early parliamentary elections, the socialist parliamentary majority and the presidential state remain to be the only rescue solution for Moldova." Dodon also outlined a program of actions that will stir up a broad popular movement in support of presidential initiatives and allow his supporters to win the forthcoming parliamentary elections in 2018. At the same time, the President of Moldova does not intend to refuse from the struggle for early voting. "According to the polls, the rating of the actions of both the government and parliament is at the level of statistical error. They understand that they cannot win the next election. Therefore, they provoke me and the pro-presidential Party of Socialists, who, according to all polls, have the support of more than half of the population, to extreme actions. They want us to pull people out to the streets so that there is some kind of provocation in order to ban the Socialists Party, impeach the president and go on a more rigid version. We will not leave this without reaction. And we will seek early parliamentary elections because this parliament is illegitimate. We will seek a presidential form of government in Moldova, and all those, who are participating in the usurpation of power today, will respond by law, "Igor Dodon said in his interview with Russian television. It is worth reminding that another sharp conflict between the pro-Moldovan president and the pro-Western government of Moldova on the appointment of a new defense minister flared up in early September 2017. The reason for it was the presidential ban on the participation of the armed forces of Moldova in the military exercises of NATO Rapid Trident-2017 on the territory of Ukraine. At the same time, Dodon relied on the principle of the country's neutrality, fixed in Article 11 of the Constitution of the Republic of Moldova. However, the government, relying on the instructions received from Western "partners", ignored the order of the head of state and authorized the dispatch of 57 Moldovan servicemen to Ukraine to participate in maneuvers that were clearly anti-Russian. It should be noted that the former defense minister, a Romanian citizen and an active supporter of Moldova's accession to NATO, AnatolŞalaruwas dismissed three days after Dodon's inauguration in late December 2016. All this time, his duties were performed by the deputy head of the defense department, George Gulbur. Candidate Eugene SturzaDodon,pro-lobbied by Plahotniuc, was rejected by Dodon three times, who argued that he is a man "far from the army and incompetent in the military field." In his turn, the president insisted on the appointment of the minister, Viktor Victor Gaichuk, who was in the presidency of Vladimir Voronin in the beginning of the 2000s and was also the spokesman of Moldova to NATO. However, the figure of Gaichuk, who stated repeatedly about the need for neutrality and partnership with both Russia and the West, did not satisfy American puppets in the Moldovan leadership, which decided to drag Sturza to the position under any circumstances. According to political expert and deputy of the Moldovan parliament Bogdan Thirdi, who is close to Igor Dodon, the structures connected with the Soros fund can stand behind Sturza's promotion. Also, Struza received $ 4200 monthly from them in 2013-2014. The expert also stated that Sturza should be brought to justice for complicity in corruption crimes committed by the governments of Vlad Filat and IurieLeanca. "A person, who was Filat's advisor, is trying to become a minister when he raided attacks on the banking system. He was an adviser to Leanca when a billion was stolen! Attention - he is a financier! Hence, I could not fail to understand that all the initiatives of Leanca would lead to the steal of a billion and the bankruptcy of BEM (Banca de Economy - the largest bank in Moldova - Tsargrad). Instead of being imprisoned, he is promoted to the office, "Tirdea said indignantly. At the same time, the political expert doubted that the appointment of Sturza as the Minister of Defense would affect positively the fighting efficiency of the Moldovan army. He remarked with sarcasm that under Sturza, Moldovan servicemen are all "learning how to do a manicure, twist curls and correctly apply gel on their heads". In fact, the illegal confirmation of the post of Minister of Defense of Moldova Sturza and the upcoming opening of the NATO office in Chisinau testify that the anti-Moldovan government will continue to turn the armed forces into the service of the global player and the territory of Moldova into a springboard for aggression against Russia. At the same time, internal confrontation within Moldova ahead of the parliamentary elections will only grow. The provocations that Western globalists' henchmen will undertake to discredit Dodon may be the most unexpected and unpredictable in their consequences. This concerns especially Transdniestria.Some irresponsible politicians in Chisinau and their patrons in the West find the solution of the problem in the format of forced reintegration into Moldova, and in fact, to Romania. It got known that the Plahotniuc team is ready to cooperate with all pro-Western and radical Unionist political forces, including the "National Unity Party", led by the already mentioned former defense minister of Moldova Shalaru, and honorary chairman - ex-president of Romania and an active supporter of the annexation of Moldova Traian Basescu and to rally for the sake of fighting Dodon and his Socialist Party. In the current situation, Dodon can only count on the support of the majority of Moldovan citizens, who may very soon face the key question: should Moldova be a sovereign and genuinely democratic state and an equal partner with all neighboring countries, or become a third-rate province of a second-rate country in the backyard of the European Union and being occupied by foreign troops that consider its territory only as a convenient springboard for pressure on Russia.